As a travel photographer, nature or landscape photographer, or travel blogger there is nothing more satisfying than capturing the perfect landscape image. From crafting the perfect angle to capturing the most beautiful light available, there’s a lot that goes into creating beautiful travel and landscape photographs. Your work isn’t done when the shutter snaps, though. After you’ve taken the perfect photograph, you still need to go through the post-processing phase. Editing, altering and fine-tuning your urban or landscape photography can be a difficult and time-consuming process that can cost you valuable time and energy. Fortunately, you can streamline your workload and create beautiful outdoor photography in an instant when you purchase our Travel & Landscape Lightroom Presets, Adobe Photoshop Actions and Camera RAW Presets. 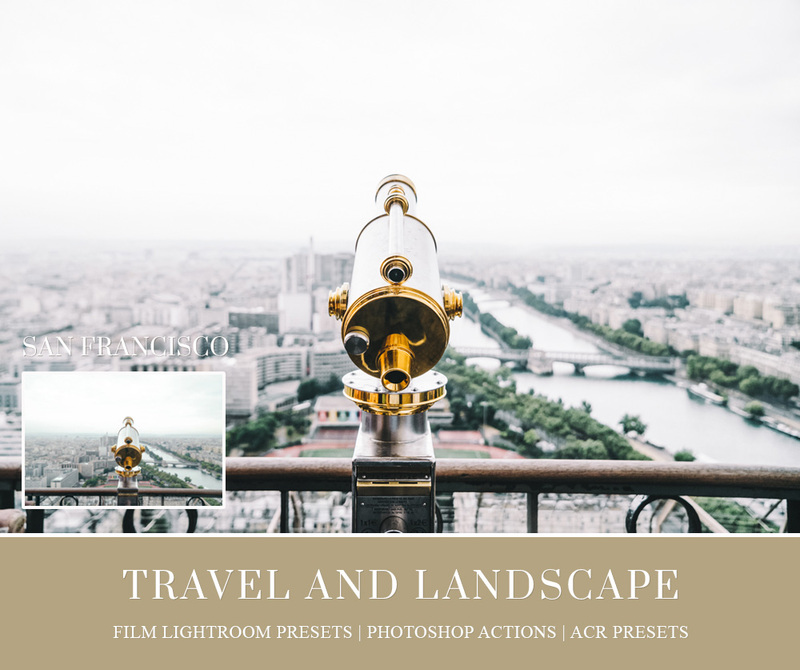 Our Landscape and Travel Lightroom Presets, Adobe Photoshop Actions and Camera RAW Preset are designed with travel photographers, travel bloggers, nature and landscape photographers in mind. Landscape photography is challenging and these presets help you create beautiful images even when the lighting or coloration was off in your original photograph. Our complete collection of Photoshop actions and Lightroom presets allows you to alter the color, clarity, and shadows of your landscape photography. Our landscape Photoshop actions also provide dozens of effects for use on Camera Raw and JPG images – from postcard effects to sketch effects. If you’re doing it manually, altering the color, lighting, and effects of outdoor photographs can be a big job. Each picture can take hours to complete and, sometimes, it’s difficult to get the correct balance between settings like saturation, highlights, clarity, and shadows. When you purchase our Travel & Landscape Lightroom Presets, Adobe Photoshop Actions and Camera RAW Presets, however, these are concerns of the past. Our presets download instantly and are compatible with both PC and MAC, so it’s easy to create beautiful images regardless of which operating system you use. One of the main features of our presets is that they allow you to apply complete effects to your photographs with a single click. These effects can help you create a mood in your photography or develop a cohesive series that can be shown together. 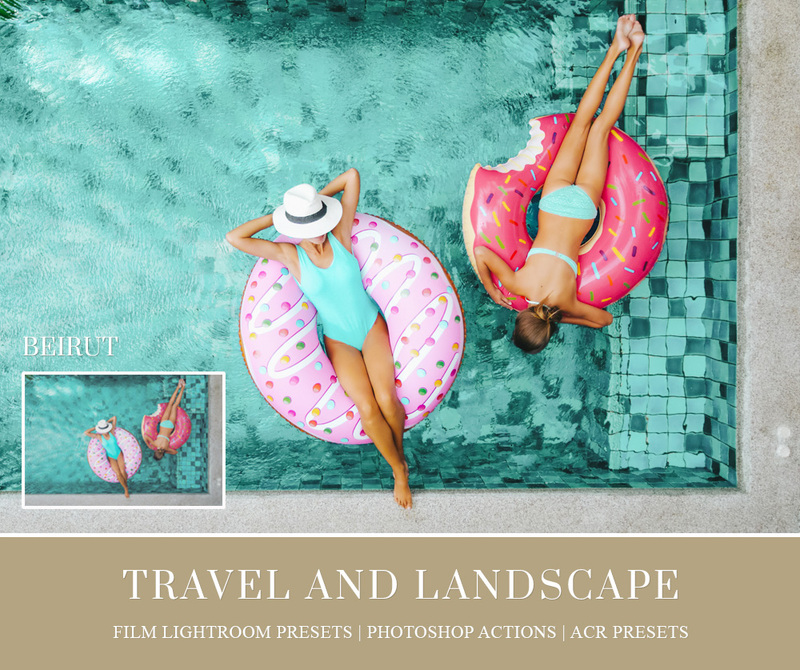 Ideal for busy travel, outdoor, nature or landscape photographers who want to create beautiful, unique, gorgeous images without spending hours editing and processing, our Travel & Landscape Lightroom Presets, Adobe Photoshop Actions and Camera RAW Presets are a true must-have for your photographic workspace.